Whenever elevated work is part of a jobsite’s activities, safety must be kept top of mind at all times. And we’re not just talking multi-story falls; many workers underestimate how dangerous a short fall can be. In general industry, work levels at a height of 4 feet or more require fall protection. Typical fall locations include flatbed trucks, scissor lifts, crane bridges, and ladders. Here are some tips to keep in mind when using these types of equipment. Make sure that the truck is parked on a level surface. Check to make sure that the deck of the trailer is free of dirt, oil, and other debris, and whether the flatbed is dry or wet. Pay attention to the task at hand, but also maintain awareness of where you are in relation to the edges of the deck. Be sure the tires are chocked prior to accessing the trailer. Stay within the boundaries of the lift’s guardrails. All aerial lifts have a load capacity rating that indicates the amount of weight the lift can safely carry. Before work begins, you must know the rating of the lift and make sure that the combined weight of all personnel, tools, equipment, and materials carried on the lift does not exceed this rating. While extending the lift, always make sure that you stay within the vertical and horizontal reach limits established by the manufacturer. If at any time the equipment appears to be malfunctioning, stop work immediately and report the problem to your supervisor. Ensure guardrails are in place on the bridge and that they meet OSHA’s standards. When working on the bridge take only the tools you need and practice good housekeeping when you are finished. If the employee on the bridge of the crane moves off the protected platform, they will need to use a full-body harness and lanyard secured to a proper anchor point. Ladders are useful to gain access to a location, and for minor or routine tasks. 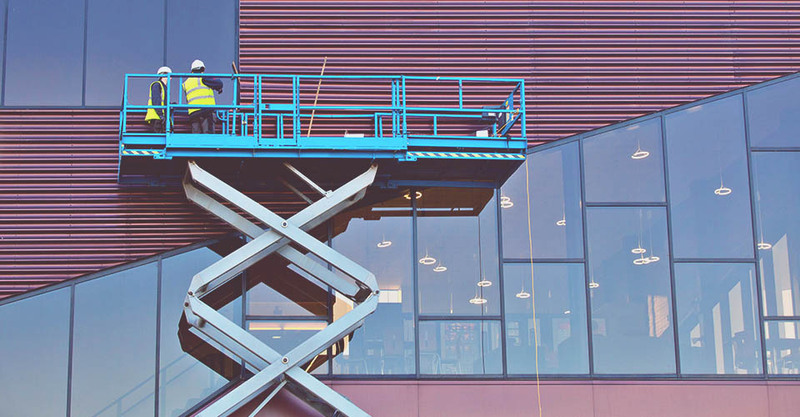 For jobs that take an extended period of time to complete, however, a work platform such as a scaffold or scissor lift is more comfortable and much safer. Consider the type, length, and weight-bearing capacity of your ladder choice. Be sure to inspect your ladder for damage before use. When moving a ladder to a location, carry it parallel to the ground and be particularly cautious when you approach areas such as doorways or corners where you have an obstructed view. To ensure a ladder’s stability, place its feet on a surface that is firm, level, and dry. On smooth surfaces, use a ladder with non-skid feet to help prevent slipping. Never climb a ladder when you do not feel well. Always wear slip-resistant footwear, and check that the soles are dry and free of oil or mud that could cause you to slip. Always maintain three points of contact between you and the ladder – which means that one hand and two feet, or two hands and one foot should be in contact with the ladder at all times. We invite you to repost this blog in your employee newsletter, on your break room bulletin boards, or share it in your next safety meeting.